ABERDEEN PROVING GROUND, MD. – When engineers from the U.S. Army Research Laboratory brainstormed on how to improve Soldier lethality, the idea of a third arm seemed like something that might help. Mechanical engineer Dan Baechle carefully planned out a device that doesn't need batteries, is lightweight and can evenly distribute the load of a heavy weapon. "It can help stabilize the weapon and take the load off of their arms," he said. "It's made from composite materials to make it as light as possible, but also to ensure the range of motion that Soldiers need." Third Arm helps take the weight of the weapons off of a Soldiers' arms. It weighs less than four pounds, but because of the innovative design, the weight of the device and the weapon are evenly distributed. "We've actually tested it with the M249 and M240B machines guns. The M240B weighs 27 pounds, and we were able to show that you can take the weight of that weapon completely off of the Soldiers' arms." Soldiers testing the device pointed out that initial versions didn't make it possible for them to use the device and go into the prone position. But that's not an issue with the current version. At a recent test with a Soldier at the Military Operations in Urban Terrain site at APG, a sergeant wore the device with an M-4 type weapon and dove into a prone fighting position from a sprint. The Third Arm provided immediate stabilization to improve marksmanship for the Soldier. "Right now it's a prototype device, and it's a fairly early stage prototype device," Baechle said. "It's been getting a lot of interest higher up in the Army, but also online with some of the stories that have come out. We're using some of the interest to help motivate further development of the device." Baechle said out that the Army Modernization Priorities include "Soldier lethality that spans all fundamentals – shooting, moving, communicating, protecting and sustaining." Further documentation specifically mentions the fielding of "load-bearing exoskeletons." "It falls in line with the direction that the Army wants to be heading in the future," Baechle said. "We get comments from Soldiers who tell us different things about the way it feels on their body…about the way it redistributes the load. Some like it, some give us tips about the ways it could be improved, and we're using that input to improve the device and improve the design so that it not only works well, but it also feels good." In 2017, the lab conducted a small pilot study of active-duty troops using Third Arm in live-fire trials. The results showed the device can improve marksmanship, reduce arm fatigue and muscle activation for some Soldiers. 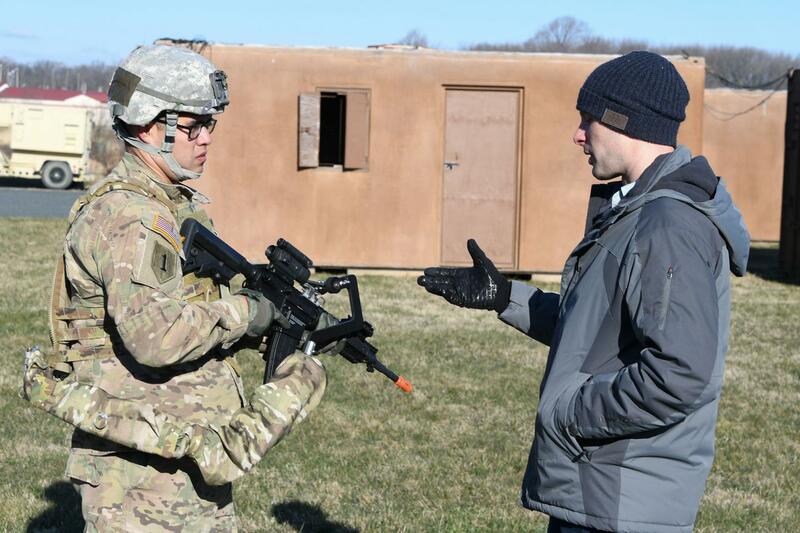 "We're using that small study to motivate a larger study this year with more Soldiers taking a look at dynamics, shooting scenarios," Baechle said. "We're still refining the device. We're starting to look at heavier weapons." Baechle stressed that what you see now, may not be what gets to future Soldiers. "What we have right now is a very specific device, but we can learn from that device," he said. "I hope in the future what we'll end up with is something that will help the Soldier. Whether or not it's in the form you see today, that's less important. Helping the Soldier is what I really hope for. I think this year is really going to be a good one and an important one in showing what this device can do."